April is going out with a bang here in Frisco! 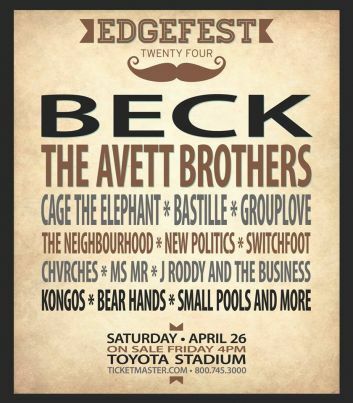 Toyota Stadium is the place to be on Saturday, when EdgeFest 24 kicks off at noon. The lineup includes names like Beck, Cage the Elephant, Switchfoot, New Politics, Bastille, The Neighbourhood and many more. A handful of tickets are still available, so grab some friends and prepare to rock out at DFW’s most popular music festival! On Saturday and Sunday, the Sci-Tech Discover Center is hosting the Mini Maker Faire, which celebrates the “maker” movement. What the heck is that, you ask? It’s basically a blend of DIY and technology with a focus on invention. Think electronics, robotics, metalworking, 3D printing and woodworking. More than 50 “makers” will be on site to impress you with their creations and possibly even inspire you to make something of your own! 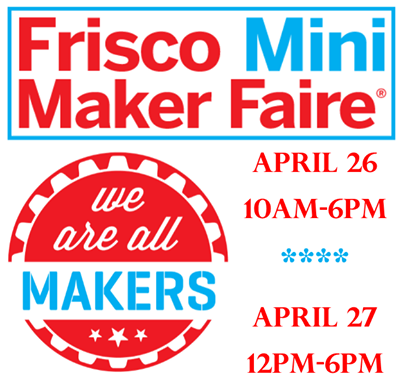 For more info on what’s happening in Frisco, VisitFrisco.com!